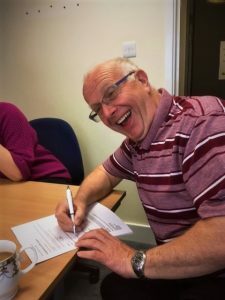 In March 2017 Withernsea Big Local was approached by Mike Cox and Gordon Beastall representing the Community Rooms at the Methodist Church to help with funding their much needed refurbishments; which the Withernsea Big Local Steering Group was only too happy to grant. As the Community Rooms are becoming an established meeting place for various local groups/organisations and individuals they were in need of an urgent facelift to make people feel even more welcome and comfortable. They had already been very successful in getting some of the funding from the Methodist Church members, James Reckitt Charity, “Flavours” Community Café, The Lions , The Buffs, Withernsea Town Council, a County Councillor and several anonymous donors, as well as a lot of volunteer hours to start the project by putting in a new floor throughout. 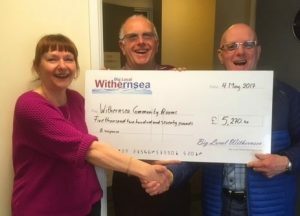 The grant of £5,270 from the Withernsea Big Local was used to assist with the costs of phase two of the refurbishments by helping to pay for the decorating, new lighting, materials for the ancillary kitchen, some much needed table trolleys and pictures for the walls. See below a very happy Mike Cox filling in the acceptance of grant form and Ute Pietsch-Bateman handing the cheque to Mike Cox and Gordon Beastall.